In a well-ventilated area disassemble shelves from cart to make it easier to spray paint. Before you begin painting, read the can label for proper application and safety instructions. Spray the cart with 2-3 coats of Krylon® Fusion All-In-One™ in Gloss White. Once the cart is fully dry use Painter’s tape to secure down the stencil on the top of the cart. Cover the remaining area with newspaper. Spray the stencil design with Krylon® Fusion All-In-One™ in Gloss Sunbeam. Repeat multiple times across the surface of the cart to make a larger design. Spray paint the dowel with 2-3 coats of Krylon® Fusion All-In-One™ in Gloss Sunbeam. Measure out enough space for hooks to hold various sized kitchen utensils with a ruler and a marking pen or pencil. Use a screwdriver to screw in multiple hooks onto the front and one side of the cart. On the second side of the cart measure out and mark the two ends of the dowel and screw two hooks into the cart at the markings. Placing the dowel onto these hooks will create a towel rack. Flip the cart on its side and screw in two wheels to the cart legs to make it portable. Keep the other two legs flat so that the cart can remain temporarily stationary. Once all parts of the cart are fully dry, screw the shelves back onto the cart. Add your favorite kitchen items such as cooking utensils, cook books, mugs and more. 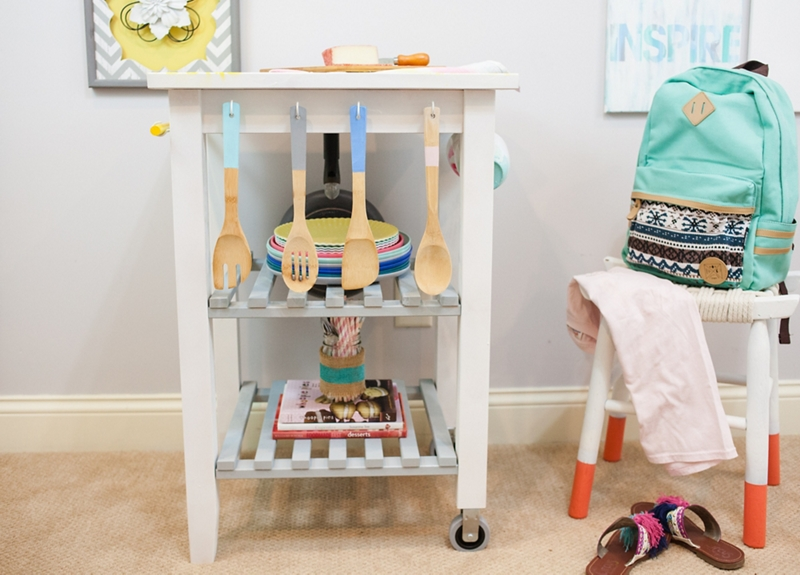 Enjoy your new portable kitchen cart for your dorm room!